In a regular view, you would link your graphics to your PLC using hard (direct) address. In the Parametric View, you can construct your tag with the help of passing parameters, which you can use in the tag address. When you construct your tag, use $index$ as part of the tag. 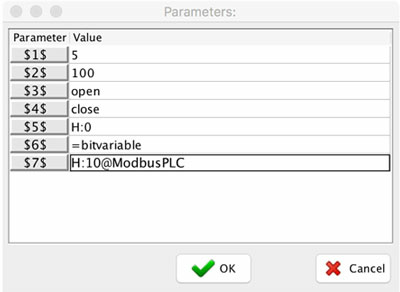 During the opening of the parametric view, $index$ will be replaced by the parameter specified by the open command. Let’s look at the parameter $6$; here we use an equation to pass the value of variable bitvariable as defined in the View Script. In parameter $7$ we pass the value read from the PLC at address H:10.